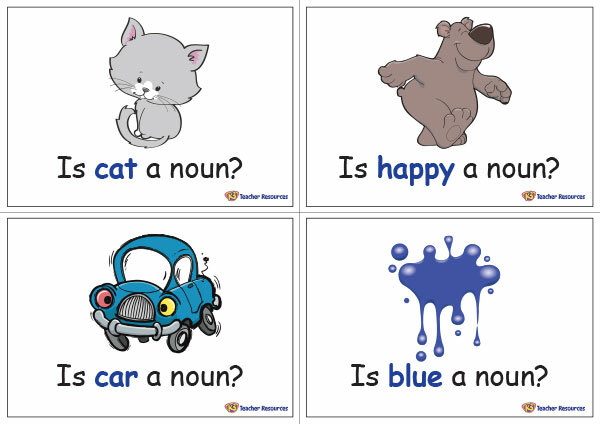 A set of Yes or No Question Cards for children to use when identifying nouns from adjectives. Use these cards as a whole class warm up activity or as part of your literacy rotations. Print, cut and laminate the title card, ‘yes’ and ‘no’ cards and each question card. Place children into small groups and provide each group with a set of cards. Children place the title at the top of their working area with the ‘yes’ and ‘no’ cards underneath, to create two columns. Children then shuffle the question cards and place them into a pile, face down. Children take turns picking a card from the top of the question card pile and placing it under the correct heading, ‘yes’ or ‘no’. If the card is a noun it is placed under the ‘yes’ heading, if it is an adjective it is placed under the ‘no’ heading. Children continue until there are no cards left in the pile. What comes next? – Children can then pick three noun cards and three adjective cards to create their own sentences. Children write their sentences into their workbook and underline the noun in each sentence.